Start of PHRF 1 Race. Nordlys, Bob Schwartz, #267, Manhasset Bay Yacht Club on the left. 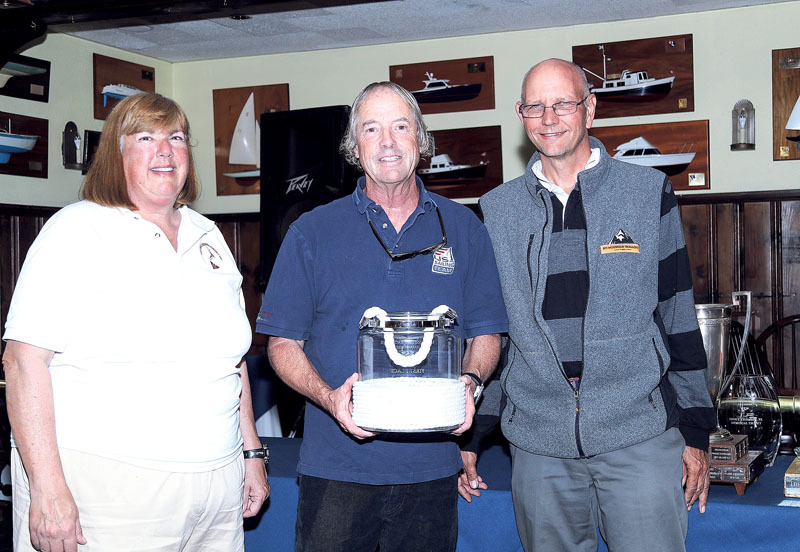 Also seen is Avalanche, Craig Albrecht #39516, Port Washington Yacht Club, who came in second in PHRF 1. 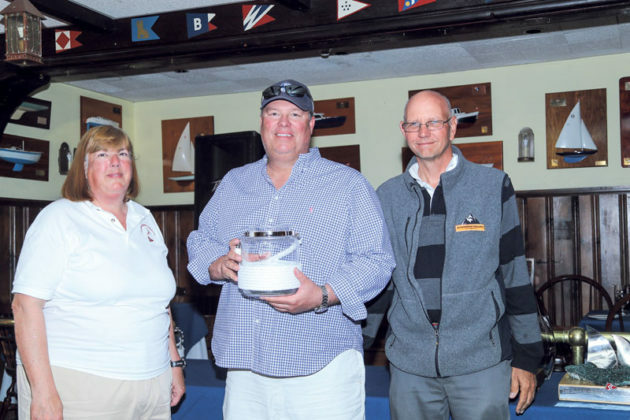 The 39th edition of Manhasset Bay Yacht Club’s Fall Series was held over the weekend of Oct. 13-15 and Oct. 21. The first weekend was devoted to around-the-buoy racing, with the last day reserved for a long distance race. Friday, the first day of racing, the wind decided to take a break and stay home. There was no racing that day and the forecast for Saturday and Sunday was dire. No wind would be making an appearance on Long Island Sound. 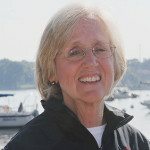 But under the leadership of Sue Miller, past commodore and principal race officer (PRO) for this event, and always positive that some wind will grace her racecourse, gathered her Race Committee, marked boats, got all RC gear on boats and headed out to Western Long Island Sound. 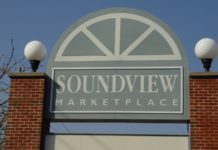 If anyone can find wind, it is Miller. One Too Many, #17, Peter Chirlian and Sabotage, #33560, Midshipman Liam Hart, United States Merchant Marine Academy (USMMA) at the start of PHRF 2. Miller and her crew managed to finish five races over the Saturday through Sunday weekend. 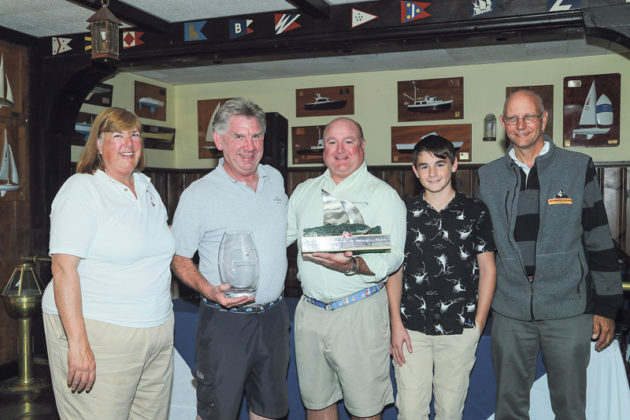 To put some perspective to the resolve of the MBYC Race Committee to get their teams racing, check this out: another yacht club who happened to have a regatta the same weekend as MBYC Fall Series, and also in Western Long Island Sound, actually believed the weather report and cancelled their regatta. The club’s esteemed Race Committee scattered to destinations near and far for long-awaited vacations. This action did not escape the spies (also called the Moosehead Committee) who wanted to reward this RC for their dereliction of duty and for actually believing a weather report. 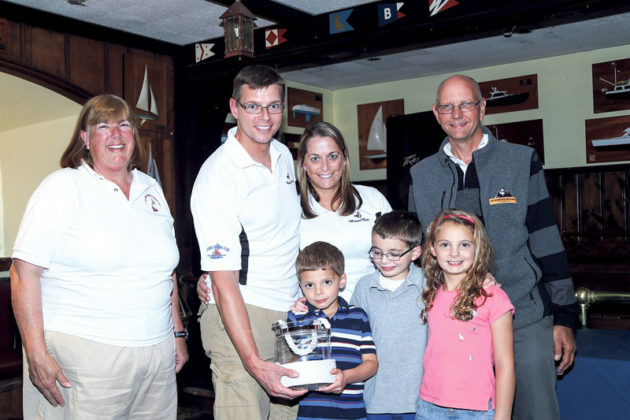 The (unnamed) yacht club was recognized at the Annual Moosehead Luncheon with a nice Moosehead trophy. For readers unfamiliar with the Moosehead Luncheon, it is a gathering of all Long Island Sound Race Committees who attend a luncheon on the first Sunday in November to socialize, have lunch and roast fellow Race Committees who “messed up big time.” The Moosehead Committee spends their time (when not racing) gathering evidence all season long, eager to “catch” a transgression worthy of a Moosehead. After attending these events over the year, yours truly must admit that this year’s treasure trove was exceptional. 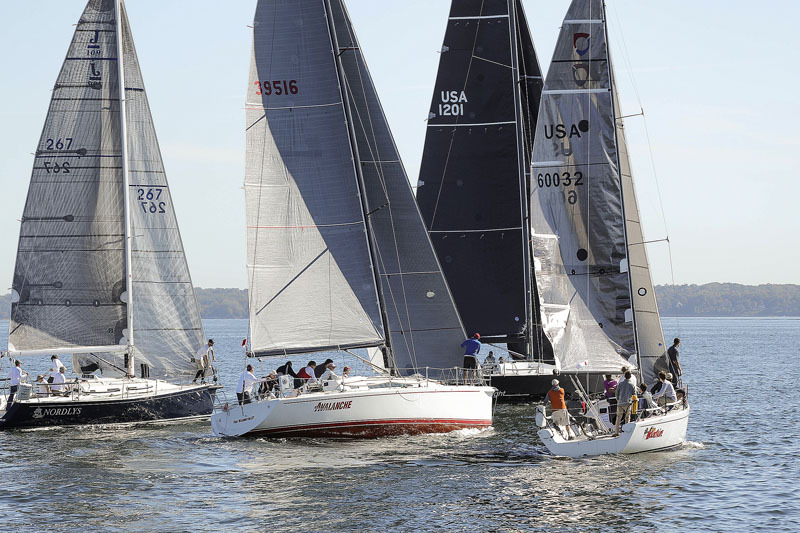 Back to the MBYC Fall Series, the last day of racing on Saturday, Nov. 21 was reserved for a distance race. The forecast was again dismal, three to four knots out of the east. Racing began around 1100 when the wind picked up and held. About half way down the course, the wind pretty much died, but then came alive to bring the boats home to port. The after party and awards began in the late afternoon. 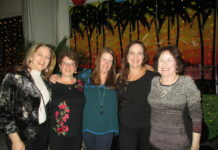 The food was great, the drinks flowed and, most importantly, the sailors were happy. 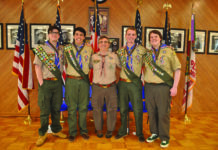 Commodore John Silbersack and PRO Miller handed out the awards to deserving teams. 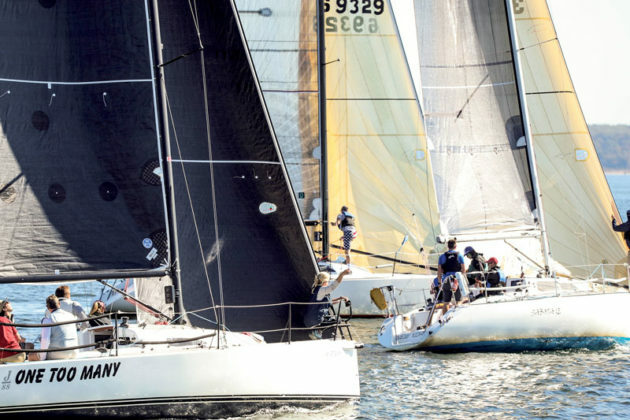 And while MBYC Fall Series signals the end of season racing on Manhasset Bay, fear not, Frostbiting has already started and yacht clubs on the bay and around Long Island Sound are gearing up for another season of winter sailing.